A New Requirement to Fly - Rosi & Gardner, P.C. April 1, 2019 Rosi & Gardner, P.C. Displayed prominently at the Grand Traverse County Clerk’s front desk is a stack of four-page, colorful publications from the Michigan Secretary of State, announcing: “As of October 1, 2020, the federal government will require that you have a REAL ID-compliant document to fly in the United States.” Perusal of a copy revealed two (2) new REAL ID-compliant drivers’ licenses. The first, at no additional cost (beyond the usual license renewal fee) will allow you to fly within the U.S., and bears star in the upper right-hand corner. Canada, Mexico, Bermuda or the Caribbean. The cost for a standard (not CDL and without any other endorsements) “Enhanced Driver’s License” is $45 at present. To get either of the new types of driver’s license when you renew, you need to take additional identification documents with you, such as your birth certificate, proof of your Social Security number, etc. when you renew your license. If you choose not to obtain either type of REAL ID-compliant drivers’ license, your new license will say: ”Not for Federal Identification.” For more information, call 888-767-6424 or visit to www.michigan.gov/REALID. Fortunately, the federal government has provided a simple option to avoid the nuisance, for anyone with a passport. 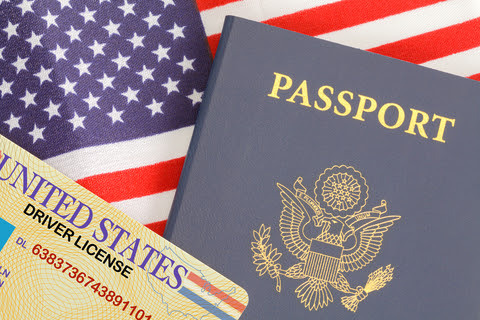 You can always use your passport to fly, both within and outside of the U.S., as well as to enter from Canada, Mexico, Bermuda or the Caribbean. There is also a “Passport card” available, the same size as a driver’s license, which may be more convenient in a purse or wallet than a full-size passport.